This is my husband’s favourite sourdough bread of the moment. It is an all round delicious bread. You have a mild sourdough flavour & you can top it with anything that you like. It is yellow-white in colour. 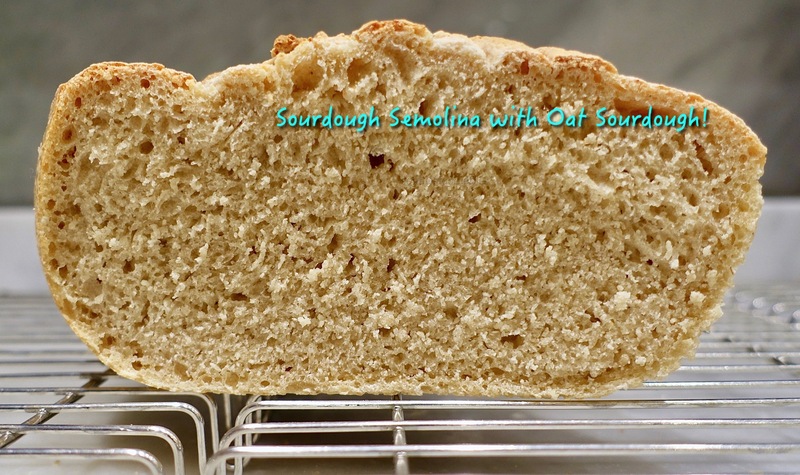 Recipe: For 1 semolina sourdough bread/ For 2 breads, double this recipe! Take your Kenwood major & place dough hook, in. In fitted bowl ad active oat sourdough & warm water. Mix on low-speed, aka number 1-2 for 15 seconds. In another bowl, add 2 flours & salt. Mix with a spoon. Add dry ingredients to bowl with wet ingredients. Start to mix on low-speed aka number 2 for 4 minutes or so. Turn power higher to number 5 & knead for 5 minutes. Then, your dough is nearly ready & elastic! Take dough out of bowl with dough scraper & knead it for another 5 minutes. You don’t need any flour!!! I do the stretch & fold method a few times. Take your bread tin & smear it in with baking margarine. You need to grease it properly, all sides & corners too. Make a roundish shape of your dough. Place in the middle of your bread tin & place closed plastic bags over it & leave it to rise for 1 long rise for 5- 6 hours, in a warm place until doubled or tripled in size. Just before baking in oven, preheat to 220°C (428 F) for at least 10 minutes. Then, score your bread. Boil water & pour it into a smaller ceramic baking dish. Put this besides or under your bread tin in the middle of the oven & reduce heat to 200°C (392 F) & bake for about 30-35 minutes or until browned & baked through! Lower oven heat if you need to. My breads were ready after 33 minutes each! When ready, remove from the oven with oven gloves! Turn bread out of the tin & place onto a wire rack to cool down completely! Tap on the bottom of the bread, if it sounds hollow, your bread is fully baked. When cold, eat! Repeat! Store in an organic bread bag! MMM! Like what you see & want receive my posts per email? Subscribe here & join 1,800 email subscribers! You will get my free E-book: Healthy Vegan Christmas too!When you subscribe to my blog, you will receive an email to confirm your subscription & then, you will receive a final thank you email where you can download the recipes in the format that you want.I have a version for a Mac, iPad, iPhone. 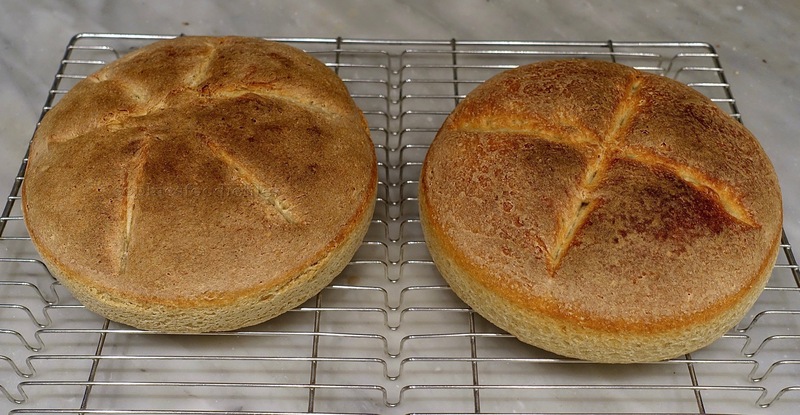 Previous Post 5-Grain Sourdough Kaiser Rolls! Ooh yes! Next Post Sourdough Kamut Bread Rolls! Thanks so much, Angie! I love a crunchy crust! Thanks so much, sweet Elaine!